Braun Strowman stripped of his Royal Rumble Universal title shot against Brock Lesnar on WWE Raw – AiPT! The Monster Among Men’s actions on Raw have cost him a title match against The Beast. Braun Strowman was scheduled to go one on one with “The Beast” Brock Lesnar at the Royal Rumble event in two weeks. But after the events that opened tonight’s episode of Monday Night Raw, it appears that is no longer happening. Strowman opened the show with a promo, claiming he would walk away from Royal Rumble with the Universal Champion and that current champ Lesnar is afraid of him. He was quickly interrupted by Baron Corbin, who provoked Strowman into chasing him backstage. 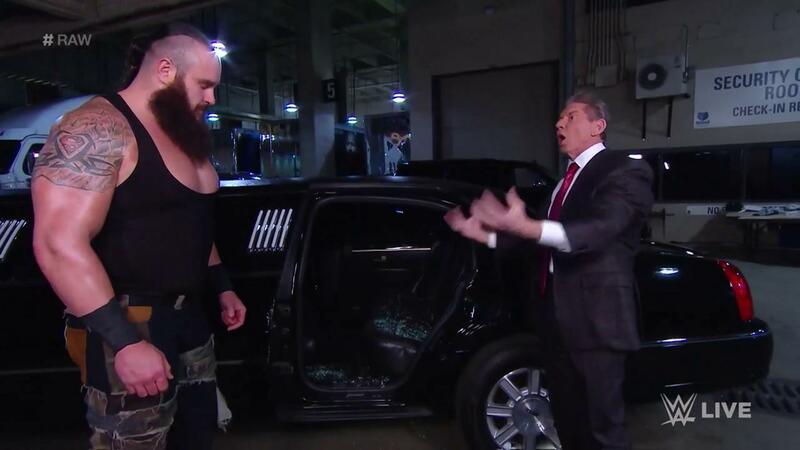 Thanks to a tip in the form of a song from Elias, Strowman was able to track down Corbin — inside Vince McMahon’s limousine. An incensed Strowman grabbed a nearby pipe (why are there always such convenient weapons lying around wrestling productions? ), smashed one of the limo’s windows and tore the door off the car’s frame. McMahon witnessed the destruction, and as a result stripped The Monster Among Men of his title opportunity at Royal Rumble. He was also fined $100,000. Outside of kayfabe, there have been rumors of backstage concern following Braun Strowman’s questionable promo performance on last week’s episode of Raw. We don’t know if that factored into this decision at all, but the timing of this decision directly after last week’s disaster is interesting. There has been no replacement opponent for Lesnar announced as of now, but commentator Corey Graves stressed that Lesnar must defend the title at the Rumble against somebody, and that we may just find out who tonight.